a movie as if it was directed by tim burton and starring johnny depp. i’m glad my girlfriend dragged me in there, fantasy usually is not up my alley. 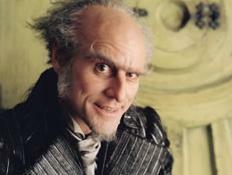 forget what you know about jim carrey, he’s at the top of his form, portraying both “count olaf” and the late thomas klestil brilliantly. he’s only topped by .. sunny the baby.